Stamford Talk: Eat, Think, Drive, Blog! : DO NOT THROW ME AWAY!!! That was the stern- and ironic!- message written on a cardboard box that my husband put out with the trash this week. Husband: The guys didn't take that cardboard box. Me, in "duh" voice: They don't TAKE cardboard, you have to tie it up with string for recycling. 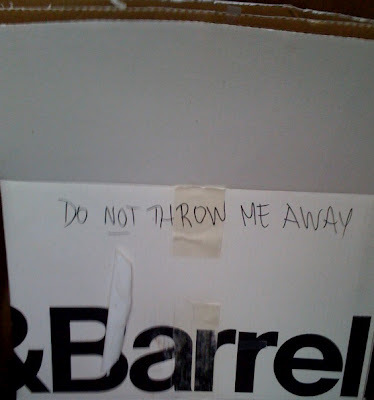 Husband: Of course, it also probably didn't help that you'd written "Do not throw away" on the box. At this point, I collapsed in laughter. I forgot that I'd written "Do not throw me away!" on that box to remind myself that it contained a cool, yet very lightweight, serving platter. I wonder what the trash guys thought when they read the box. The really embarrassing part of the story is that another side of the box said, "Use me for a par-tay." I obviously was NOT going to put the box outside like that. I was going to bundle it up with the other 1,000 boxes in our basement. My husband finds it hard to believe that they won't just take our boxes, so sometimes he brazenly leaves them out with the Toter trash bin. I laugh whenever I think about the ridiculous message(s) on the box. Have AH&UC swing by and bring you up to speed on the new recycling approach. Toss it all in the new recycling Toter, yo. Single stream rocks. that's hilarious about the par-tay! more cardboard box stories! puullleaze!! those new recyle cans are at least 3 or 4 weeks away from a call. they did not anticipate demand and have run out!, very sadly! I have been waiting 6 weeks! "Do not throw me away!" "Use me for a par-tay." Sounds like the tag line for a movie about a girl with issues. I just cracked up when I read this.